Address: Avonmore Road, West Kensington. 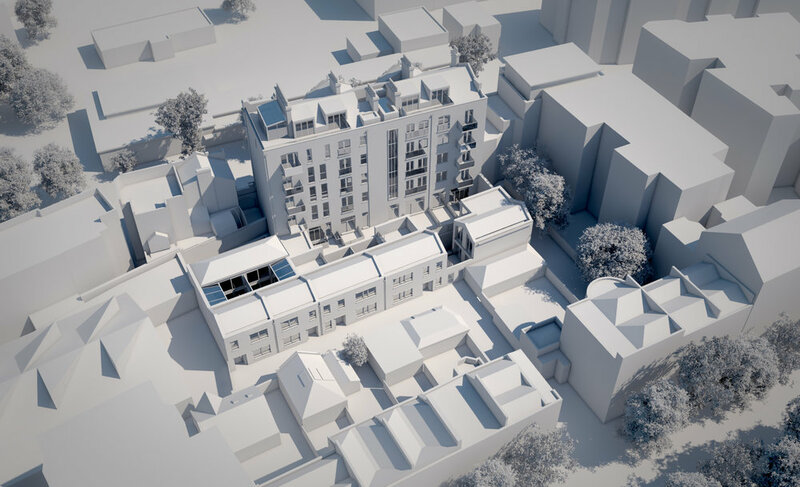 In the London Borough of Hammersmith & Fulham, KC+A has received planning for 20 homes as part of a conversion project that transforms, Leigh Court, an early 20th Century building on Avonmore Road. The original structure housed workers for J Lyons & Co. and had offices at ground level with a warehouse at the rear. The proposals convert Leigh Court into eleven apartments and four lateral penthouses. The warehouse is replaced with a mews of five contemporary houses. Prime residential accommodation is arranged around a series of courtyards, terraces and balconies with communal facilities managed by a concierge. Leigh Court’s handsome Edwardian façade will be restored and the new houses are a contemporary interpretation of the fine brick and sandstone detailing predominant in the area. Throughout the design process KC+A consulted with local residents and ward councilors allowing the scheme to evolve in such a way as to address concerns and to eventually win active support for the proposals.